Mainit na pagbati ang inihahatid ko sa mga tunay na bida ng okasyong ito— ang mga graduates at completers ng Taong Pampaaralan 2018-2019! 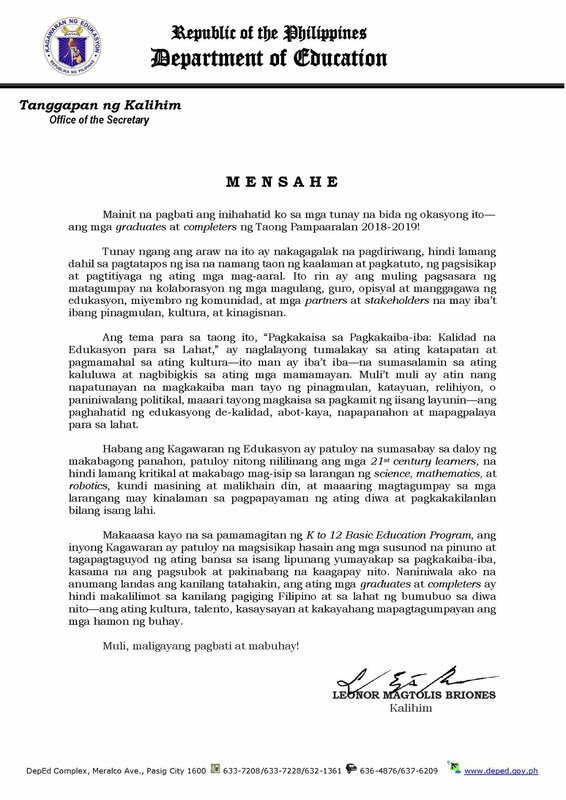 While the Department of Education (DepEd) has carried on and embraced change amid technological advancements and the continuously shifting socioeconomic landscape, it commits itself to the holistic development of 21st century learners who are not only critical and innovative thinkers in the fields of science, mathematics, and robotics, but who are also artistic and creative, and can thrive in the fields that appeal to our soul and our sense of identity. Download the official Graduation Message in English and Filipino at TeacherPH Facebook Group.